Create a diagrammatic district energy plan for the Bellevue Gateway development. 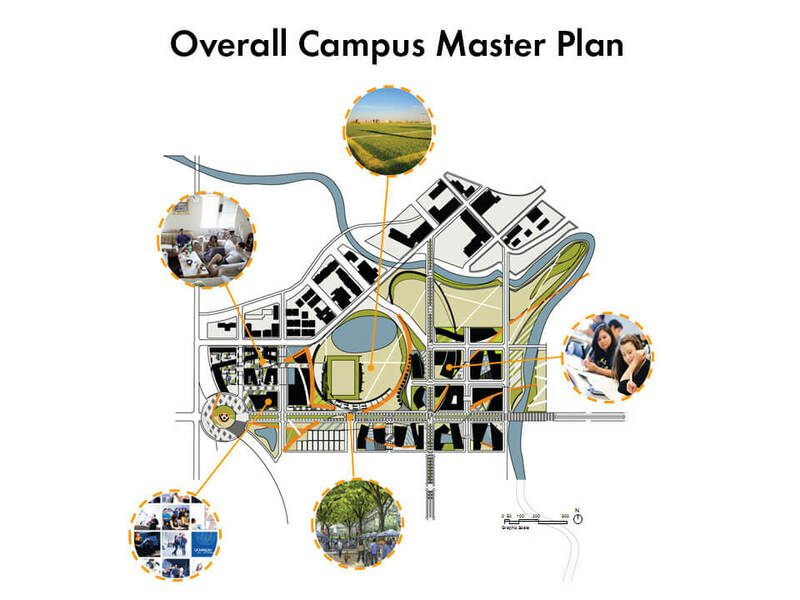 The existing site consists of two parking lots and grazing land on the UC Merced campus in California’s San Joaquin Valley. The San Joaquin Valley consists of a long, flat agricultural landscape that is exceptionally arid with extreme fluctuation of temperature. Create self-sustaining housing for over one thousand students of different degrees and ages. This complex was to generate its own energy, remove its own waste and to create an inspirational and nurturing place to live and learn. 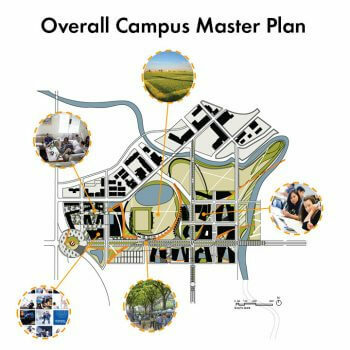 The big idea was to create a life-force for the campus that would be a central point of connection, creating a living and breathing campus from the macro and micro perspectives. 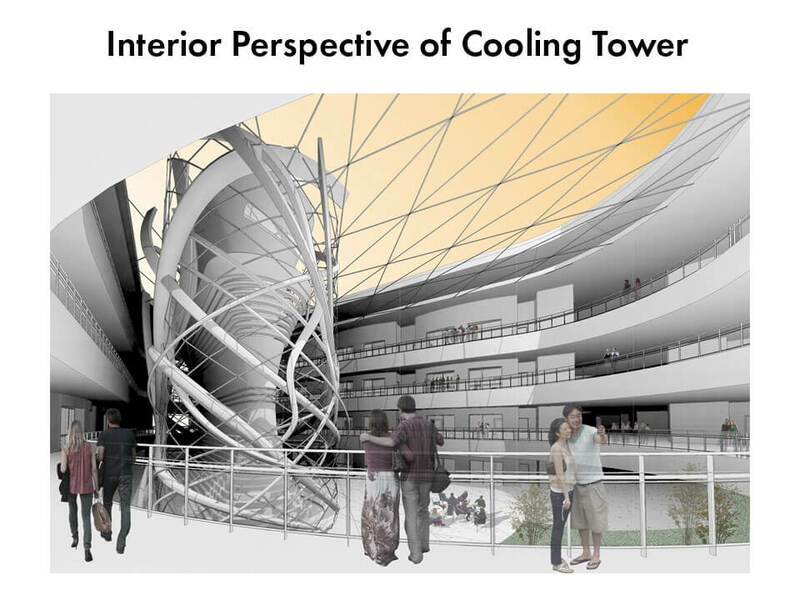 The pivotal tower element of the master plan provides a focus of energy, organization and identity for that life force. Water and landscape elements flow from this tower creating meaningful relationships and paths for the inhabitants as they move through the campus. Future buildings and hardscape elements define future development and open spaces for recreation and play. The student housing complex consists of a self-contained complex where student housing units open into a large connected atrium. 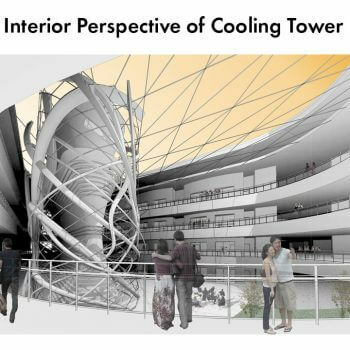 Parking is underground where large natural cooling towers utilizing the ground water cools and cleans the air coming into the complex while removing the pollutants from the cars. The exterior skin of the building is a mixture of energy producing solar panels and highly insulating + translucent material that feeds the energy needs of the building and allows natural light into the core. Through this natural cooling/heating system and the solar panels located on the large connecting roof and exterior skin, the resulting energy usage from the existing energy grid is below 0.